Pewter Charms - Charm Your Way to Fortune and Charm Away Misfortune! Among all pewter accessories, pewter charms are certainly very popular. But what are charms, really? In general, charms include items such as amulets, talismans and touch pieces. While touch pieces are typically coins and medals, amulets and talismans can be anything from gems and pendants, to plants and animals. 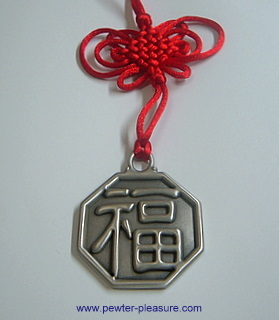 Religious objects are especially common as amulets. Christians can be found wearing crosses while the Buddhists would wear Buddha pendants. Among the Chinese, it is not unusual to see people wearing jade pendants of the Goddess Guan Yin around their necks. Charms are usually worn or kept to bring luck or to provide protection against evil or misfortune. For example, it is widely believed that a four-leaf clover brings good luck to its finder. A horseshoe, if hung on a door, is also thought to be a lucky charm. And if you don't know already, the crucifix is also used by many people to protect themselves from demons and spirits. In short, charms can be anything. It all depends on culture, faith, and location. What is considered lucky for a group of people can be unlucky for another. The shape is octagonal, which is considered auspicious in Chinese culture. In fact the Chinese associate anything eight with wealth and prosperity. The obsession with eight even got to the Beijing Olympics. Did you know that it was held on 8 August 2008? And that the opening ceremony started at 8:08:08 pm? I came across this very beautiful pewter charm at a second hand shop not long ago. It certainly got my attention the moment I set my eyes upon it. Needless to say, I bought it instantly. It comes a little short of 2 inches long, and slightly over 1 inch wide. The reddish area is due to some paint, probably enamel. It definitely enhanced the look of the whole piece. Since I didn't know what it meant, I did a bit of online search and was pleasantly surprised when I found it being sold over the internet. Apparently this little beauty is called a Rosycroix, which means the 'Rose of Immortality'. Definitely something mythical of fantastical. As a charm, it supposedly suffuses the wearer with youthfulness and immortality. Doesn't matter if you don't believe this. It's still a very nice piece of pewter. You have to look at it to appreciate the level of detail put into the design. Interested to read about other pewter accessories? You can check them out in this website.